One of the key developments in 20th and 21st century history has been the demographic revolution, or demographic transition, which radically changed the course of fundamental demographic processes involving the birth rate, mortality and migration. These changes have had, and continue to have, a significant effect on all aspects of life in modern and developing societies, including their economies, social relations, culture and political life. In addition, they greatly influence the crucial sphere of international relations, and create unprecedented challenges for international security. Demographic change affects the international situation both directly and indirectly, through the social processes experienced by all societies which embrace this change. The direct and obvious influence of demographic processes on the international situation is caused by the very existence of the global population explosion, unprecedented in speed and scale and characterized by extreme geographical irregularity. The demographic masses of different countries and regions are changing at a breakneck speed, affecting the global power balance. This, in turn, logically affects the entire system of international relations. The Earth’s population in the early 20th century was around 1.7 billion people. Within a single century, that figure grew by 4.5 billion. The current global population stands at 7.6 billion; the World Bank estimates that only 1.2 billion live in rich countries, where the annual per capita GDP exceeds $12,000. The population size of these countries has stabilized, whereas elsewhere in the world it continues to grow. As a result, the global population may exceed 11 billion people by the end of the century, and the population of the countries that are considered rich today will account for only a tiny proportion of this figure (see Fig.1). Source: UN Population Division. World Population Prospects: The 2017 Revision, DVD Edition. Countries with giant populations emerge as new influential actors in the global political arena; new power centres emerge, as do new risks and threats to international security. International actors are sovereign states. In the mid-20th century, the combined population of the world’s 20 largest countries stood at 1.9 billion people, or 74.4 per cent of the global population.1 The top 20 countries included eight European countries, the United States and Japan, which together accounted for a quarter (25.3 per cent) of the global population. The demographic weight of the leading 20 countries has not changed much since: in 2015, they accounted for 70.3 per cent of the global population. The composition of the top 20 countries changed considerably, however: only two European countries, the United States and Japan remained on the list, and their combined demographic weight dropped to 9.1 per cent. The United Nations forecasts that by the middle of the 21st century, the global North will only be represented by the United States, Russia and Japan on that list (making up 6.5 per cent of the global population), and that by the end of the century, only the United States will remain, accounting for 4 per cent of the global population (see Table 1). Until recently, the rich and developed countries – members of the notional global North – believed themselves to be the owners of the world and main drivers of the world order. Today, they are increasingly turning into a demographic minority. The global South, for its part, with its rapidly growing population, is also developing economically. Yesterday’s “backward” agricultural countries are increasingly modernizing their economies, embracing the centuries of economic, social and technological experience accumulated by Europe, and in a number of instances, rapidly building their military potential. They remain much poorer than the countries of the North in terms of per-capita GDP, but huge populations allow their centralized governments to concentrate their combined resources, which are compatible with the resources of the wealthiest countries. The population of China is much poorer than that of any developed country; nevertheless, in terms of the combined GDP, China has long secured its status as the world’s second-largest economy. The rapid change in the global power balance jeopardizes and erodes the de facto world order established after World War II, as well as the post-war perceptions of superpowers, power poles, hotbeds of tension confrontation, etc. This change is largely caused by the global population explosion, which testifies to the enormous influence of demographic processes on international relations and international security. However, despite the unquestionable importance of qualitative correlations as applied to population size, economic potential or military might, they are not the key factor determining the behaviour of international actors. Of much greater significance are social processes in each separate country that impact government policies, including foreign policies. The countries currently going through the demographic revolution may differ immensely, but fundamental demographic shifts set them on roughly the same inevitable course of social change. This involves the emergence of risk factors endangering international security. Since the second half of the 20th century, the countries representing the global South, where the population explosion is taking place, have been increasingly involved in modernization processes. The multifaceted change born of modernization dictates the course and intensity of social processes which, in turn, determine the state of developing societies. The driving forces behind this change, and its very essence, cannot be reduced to pure demography. In fact, modernization itself, with its varied success stories and failures from one country to another, is largely influenced by economic, social and political factors. Demographic factors are but one of the groups of factors stimulating modernization, accelerating or inhibiting modernization processes. Nevertheless, demography should not be neglected: fundamental demographic change is intertwined with and exerts significant influence on economic, social and other changes, so it must be regarded as a major factor influencing the state of society and government policies and generating risk factors that affect international security. The irreversible change in a population’s age composition, or population ageing, as it is known to those who study demographics, is one of the most obvious consequences of the demographic revolution. It should be noted that population ageing manifests itself in the late phases of the demographic revolution, with the onset of low birth rate in response to the reduction in mortality. At present, this situation is pertinent to all developed countries, but not to the developing world. The fact that the decreasing birth rate lags behind the reduction in mortality results in younger age groups accounting for an extremely high proportion of the total population. Source: UN Population Division. World Population Prospects: The 2017 Revision, DVD Edition. File POP/5. Source: UN Department of Economic and Social Affairs, Population Division (2015). World Population Prospects: The 2015 Revision, DVD Edition. In the countries with the lowest median age, over a third of the adult population is made up by adolescents and young people aged between 15 and 25. The figure is twice as high in low-income countries as in high-income ones. It is also fairly high in medium-income countries, but is still lower than that for low-income countries and is evidently decreasing (see Fig. 4). The huge number of young people and adolescents, essentially children, often poorly educated or not educated at all, growing up in poor countries with high levels of unemployment, possessing no tangible future and zero life experience, are easily manipulated with catchy slogans appealing to blind faith rather than rational thinking. Hence the political term “youth bulge,” which is associated with a high risk of political upheavals and the emergence of extremist political regimes whose existence jeopardizes the current international security system. Urbanization is normally not associated with the demographic revolution: it is viewed as an independent process determined primarily by economic factors. However, back in the 1970s, Wilbur Zelinsky postulated a mobility transition as an organic part of the demographic revolution.2 Traditional agricultural societies are characterized by low mobility; their members are unlikely to leave their agriculture-centred households and migrate en masse. The reduction in mortality, which is a trigger of demographic revolutions, results in areas with restricted land resources having excessive populations. These excessive human resources are then forced to seek jobs outside the agricultural sector. This, in turn, requires an increase in the population’s professional and social skills, which inevitably results in higher territorial mobility. The entire society thus comes into motion; new growth points for non-agricultural trades sprout up in existing or newly established cities, which turn into new focal points for economic activity and, by extension, for the migrating population. This process has only been able to happen thanks to the emergence of the historically new sociodemographic phenomenon of en-masse individual voluntary migration (also known as migration transition). The phenomenon was first recorded in Europe, and became quite widespread in the 18th century, ultimately facilitating pan-European urbanization. While the process of urbanization was gradual in Europe, it was not without its difficulties and would result in the emergence of marginalized urban strata accountable for significant social tensions and upheavals. The European legacy is now a thing of the past. But history keeps repeating itself on a much larger scale in developing countries that are living through their own version of the population explosion. These countries are experiencing their own version of the mobility revolution and migration transition, which have resulted in skyrocketing levels of internal migration related to urbanization. Unlike the piecemeal European urbanization process, which took place over the course of several centuries, third-world urbanization is explosive. The urban population of developing countries grew tenfold between 1950 and 2015 (an increase of 2.7 billion people), mostly thanks to rural residents’ migration to cities. In 2008, the global urban population exceeded the rural population for the first time in history (see Fig. 5). The global increase in the rural population has effectively stopped, with the demographic increase bleeding to cities. Source: UN Population Division. World Urbanization Prospects: The 2014 Revision, CD-ROM Edition. The incredibly fast and massive urbanization processes in ill-prepared, poor and until recently predominantly agricultural countries resulted in the emergence of densely populated, marginalized city suburbs. These countries are still only partly urban: they have not got to the point of negating their agricultural heritage completely, as evidenced by the way they are living their newly urbanized lives. Even though the new city dwellers normally copycat the habits of established residents, they take some time to embrace the urban system of values (which itself is fairly novel in countries that have only just undergone urbanization). This cultural duality affects the stability of the newcomers’ social behaviour, which does little to help social and political stability in many developing countries. Any developing country embracing modernization is bound to experience a crisis in its traditional culture. The cultural matrix of peasant communities, which are characterized by low mobility, takes serious hits when confronted with the new technology- and knowledge-driven economy and the lifestyle of educated and dynamic city dwellers, both of which are essential to the urban environment. We should not underestimate the direct contribution of demographic change to the emergence and development of this conflict. The main avenue for restoration of the demographic balance disturbed by the decline in mortality is to reduce fertility. This requires a radical revision of socially accepted behavioural norms as applied to the family. Cultural regulation of family affairs affects a broad range of personal issues, including the distribution of gender- and age-specific roles, the schemes of interaction between men and women and between parents and children, sexual and family morals, societal attitudes towards reproduction and upbringing of offspring, and so on. This regulation, which determines the daily behaviour of people, forms a very important part of any cultural system. The demographic revolution overhauls the established behavioural formats and demands a complete revision of the targets and mechanisms of cultural regulations. No transition from old standards to new ones is ever conflict-free: it inevitably splits society into two groups: supporters of the old standards and proponents of the new ones. This split affects each and every household to varying degrees, exacerbating the overall conflict within the cultures of modernizing societies. And cultural conflicts do tend, under certain circumstances, to transform into political ones. All things considered, the changes caused by the demographic revolution interact with economic and social transformations, which change the landscape of the contemporary world. Demography contributes significantly to the burden of difficult problems facing developing countries that are only just embracing modernization. The unprecedented explosive population growth and the population’s growing mobility are confronted by limited economic resources and restricted throughput capacity of social lifts. Urbanization and the continuing development of non-agricultural economic sectors are increasingly becoming the natural answer to worsening economic and social problems, but those problems are growing too fast, reducing the effectiveness of the responsive measures and hampering the search for a remedy. Efforts aimed at reducing the birth rate to curb population growth and thus hinder the exacerbation of the problems at hand result in the emergence of cultural conflicts and are frequently resisted. All this affects the state and stability of societies undergoing modernization. Such societies are increasingly swayed by the emergent marginal urban strata, which themselves are a product of ongoing modernization. Millions of young and arguably immature people, who are suffering from a cultural identity crisis, have no prospects and are unsatisfied with their position in society, fall prey to assorted radical utopian ideologies or fundamentalist religious movements that wield significant mobilization resources. This is fertile soil for individual or collective international terrorism, but it may also breed more serious international threats. Many overpopulated poor countries are experiencing increasing internal tensions and political instability, which may result in foreign policy disputes. Foreign political rhetoric already plays a major part in the domestic politics of many countries, sometimes leading to actual confrontations and military conflicts. Changes to the global demographic balance and the emergence of giant states with unlimited human resources in the absence of sufficient internal stability multiplies threats to international security. The experience of Europe in the 18th and 19th centuries demonstrates that demographic transition as part of the greater demographic revolution facilitated not just internal migration and urbanization, but also mass international migration, which relied on the same incentives and newly acquired social characteristics as did individual internal migration. The newly acquired mobility of Europeans, combined with the development of means of transportation, paved the way for unprecedented intercontinental migration flows, which served as an effective response to the European population explosion of the 19th century and, in the process, resulted in the emergence of new states that reshaped the political map and the global balance of powers. The current demographic revolution, which is global in nature, is proceeding according to the same scenario. New city dwellers in Asia, Africa and Latin America are no longer low-mobility rural dwellers who cannot imagine leaving their village home for good and seeking a new life in a world of seemingly limitless opportunities. Migration from rural areas to cities is a lesson in public mobility, but it is also a predictor of international migration drives, whose size keeps growing. The direction of these drives is obvious: people are moving from poorer countries to wealthier ones. Between 1950 and 2015, a total of 126 million people migrated to high-income countries; the United Nations’ moderate, fairly conservative forecast predicts that another 184 million will follow suit by the end of the 21st century. The combined tally stands at 310 million, while the population of the wealthy countries amounted to 1.1 billion in 2000 and the tiny growth that it has demonstrated is mostly thanks to the incoming migrants.3The poor developing countries are becoming richer thanks to their modernization efforts. One would imagine that this would put a break on immigration. However, if a decline in immigration does happen, it is only when a certain income threshold is hit. 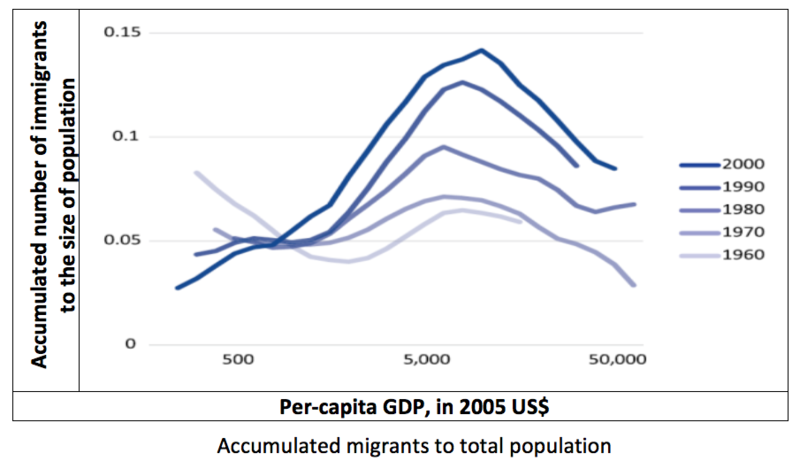 Before that happens, growing incomes actually facilitate immigration from developing countries (see Fig. 6). This increase may continue for a long period of time, because incomes in poor countries do not rise overnight. Source: World Migration Report 2018. International Organization for Migration, 2017, p. 156. The population of Africa is growing particularly rapidly. Between 1990 and 2015, the population of Europe stayed roughly the same, whereas the population of Asia grew by 37 per cent and the population of Latin America grew by 42 per cent. To compare, the African population rose by 88 per cent. It should also be noted that Africa remains the poorest continent in the world. The internal mobility of the African population was rather high 25 years ago and has not increased much since. 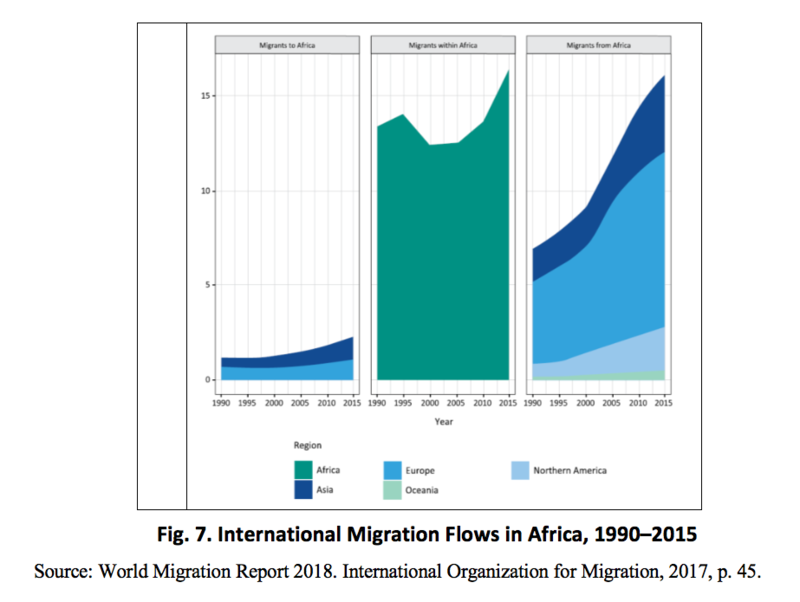 On the other hand, the number of migrants to countries outside Africa has doubled to over 16 million, becoming comparable to the number of migrants within the continent (see Fig. 7), and is projected to grow further. Source: World Migration Report 2018. International Organization for Migration, 2017, p. 45. It would appear that modern-day international migration trends do not affect intergovernmental relations in any significant way. Hence the tendency to exclude these from the list of priority problems facing international relations, or indeed from the list of threats to international security. They are more likely to be discussed as an issue pertaining to the domestic policy of host countries. The tables may turn, however, as the growing scale of these problems affects opinions over time. The host countries representing the global North are growing increasingly worried about the rising influx of immigrants. Negative public sentiments against migrants are on the rise, which is also affecting international relations, albeit indirectly, as evidenced by Brexit and the tensions among other EU countries owing to the refusal of some to accept Syrian refugees. However, it is not up to the host countries to resolve the situation. Rather, it is the task of the countries from which migration originates. The South’s migration pressure on the North, currently manifested in the massive influx of individual voluntary migrants, is merely a reflection of the global demographic imbalance. Migration historically acts as a demographic pressure valve in the history of humanity, one that helps to regulate the size of the population, even though the mechanisms involved may vary. There were times when migration took the form of a relatively peaceful resettlement on unoccupied lands; in other instances, some people would be driven out by others over protracted periods of time. In some cases, however, migration came in the form of devastating and bloody military invasions. Even the conquest of the New World in the 18th and 19th centuries, mainly carried out through individual migration of the modern type, was accompanied by the extermination of local populations and the introduction of exported slaves. At first glance, this scenario is impossible in the contemporary world. However, the aforementioned information illustrating the inevitability of social and political instability in developing societies experiencing a population explosion leaves little room for optimism. The global South is sitting on a powder keg that may detonate at any moment; it periodically experiences moments of political turbulence, which are fraught with high risks. The South’s demographic pressure on the North might take various forms, from terror attacks to political and military pressure, which is potentially capable of massively reshaping the global political map and throwing civilization as we know it, with all its achievements, back down the historical timeline. Anatoly Vishnevsky is director of the Institute of Demography at the National Research University Higher School of Economics, Moscow, and member of the Russian Academy of Natural Sciences. 1 The USSR is not listed, but Russia and Ukraine are. 2 Zelinsky W. The Hypothesis of the mobility transition // Geographical Review. 1971. Vol. 61. No. 2. 3 UN Population Division. World Population Prospects: The 2017 Revision, DVD Edition.